William joined MacDonald Weiss after graduating from the Notre Dame Law School in 2016. 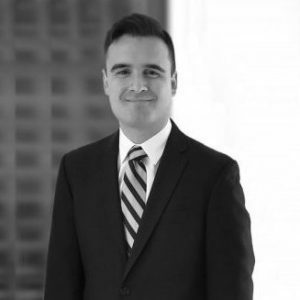 He entered law school with over five years of experience in the human rights and international development sector, and served as an article editor of the Notre Dame Journal of International and Comparative Law. While studying at Notre Dame, William spent three months as a legal extern at the legal affairs office of Rush University Medical Center in Chicago. He was also a summer clerk at the United States Bankruptcy Court for the District of Puerto Rico in San Juan and the United States District Court for the Northern District of Illinois in Chicago. William received his B.A. degree from the University of Connecticut. He spent a year studying in Paris, France where he earned a Certificat de Langue et Civilisation Françaises from the Cours de Civilisation Française de la Sorbonne. He also received his M.A. degree from the New School’s Graduate Program in International Affairs. Before law school, William worked at UNICEF Headquarters in New York and the Yale Child Study Center in New Haven, Connecticut, where he worked on several early childhood development research projects, including research field trips to Angola, Peru, and Uganda. William’s practice centers on general corporate, consumer, and regulatory law. Il a grandi à Montreal, Québec, et il parle français assez bien.